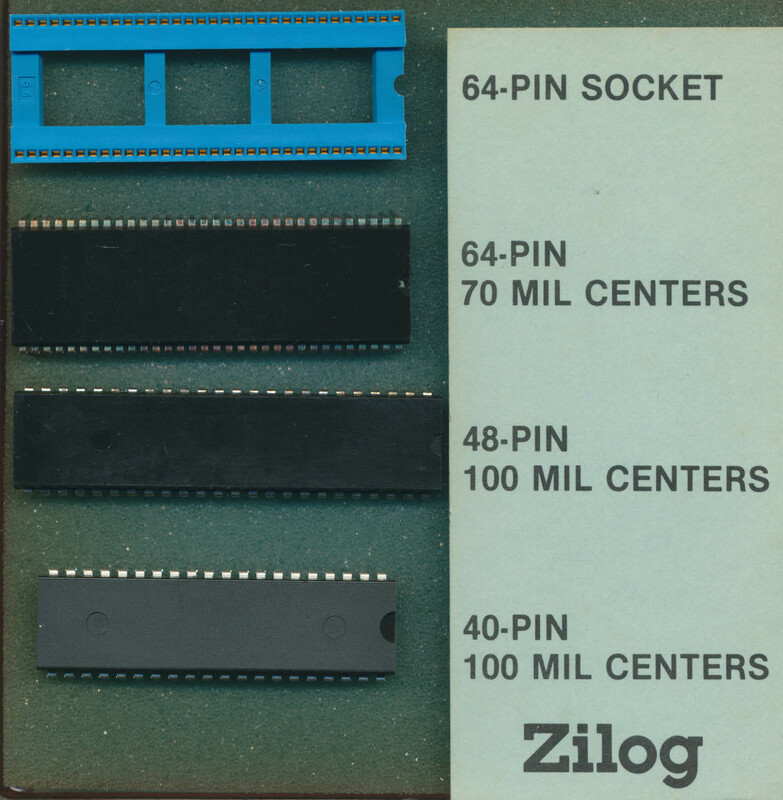 Last week we showed you an educational kit from Zilog showing the process involved in making and assembling a Z80 processor, from polished wafer to packaging. 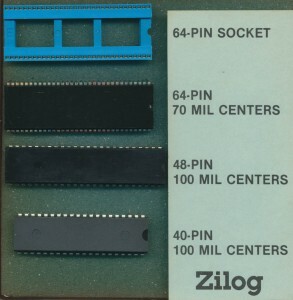 Zilog also made a kit for marketing the various packages used. This kit contains a shrink DIP 64 pin socket, a shrink DIP 64pin package, a 48 pin DIP and 40 pin DIP, all the common packages used at the time. At the time is a little hard to track down as no date is provided with this kit. We can get very close though looking at the back where Zilog lists which devices are available in these packages. The usual Z80 and Z8000 series are both there as well as the Z8 microcontroller family. 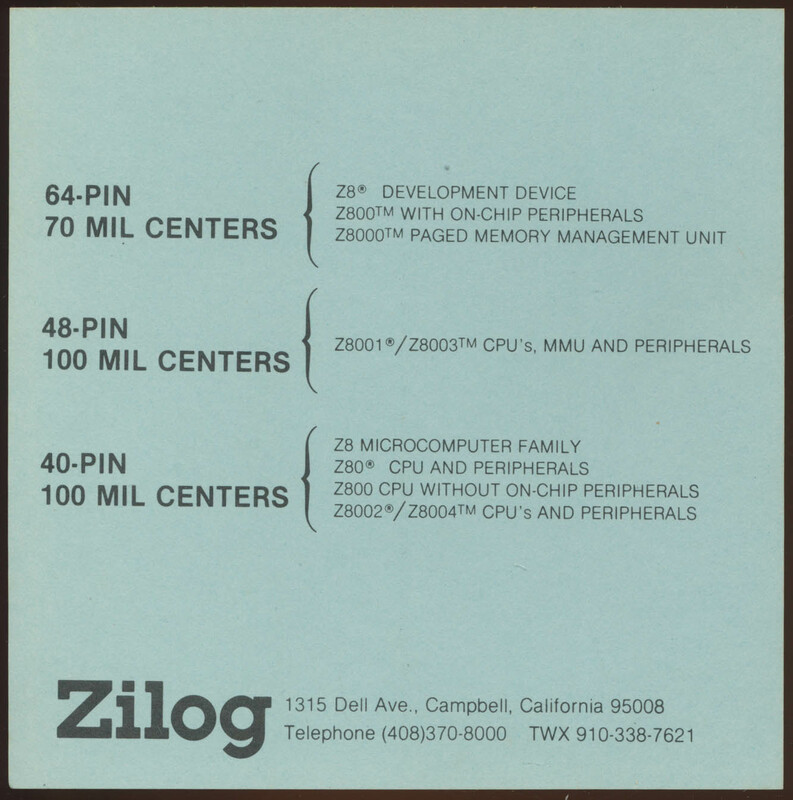 The one odd-ball is the Zilog Z800. The Z800 was an upgraded Z80 released in 1985, adding on chip cache an MMU and a vastly expanded instruction set (over 2000 instruction/addressing modes). It was wholly unsuccessful partly do to bad marketing by Zilog, and partly because it did more then it needed to. 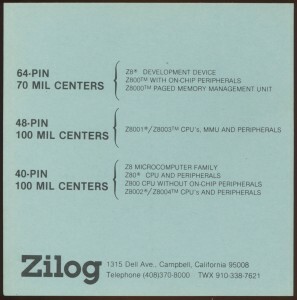 It never entered mass production, and by 1986 Zilog has redesigned it, converted the design to CMOS (from NMOS) and released it as the Z280 which met the same fate as the Z800. It seemed that making an overly complicated Z80 wasn’t what the market wanted. THe Z180 (designed by Hitachi) and the Zilog eZ80 (released in 2001), have enjoyed much wider success, mainly because they kept closer to the simplicity of the original Z80. So when was this kit put together? Likely 1985, as the Z800 was nly talked about for a few months before quietly being put away.